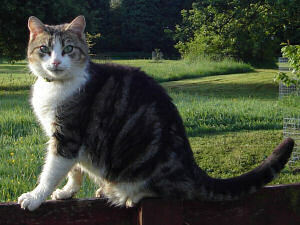 Jazz is a six year old spayed female tabby of good strong Lancastrian farmstock; who spends all her days hunting in the field behind our house. We’ve had her since she was a kitten but I have to admit that I did not notice that anything was wrong – she is very active, eats well and drinks a bowl of water most nights but nothing abnormal. Because of the weekend, my vet decided to start insulin yesterday (Monday 15 October) and so I gave my first injection of two units of Caninsulin yesterday morning! We’ve started on two injections of two units but next Monday she will have a glucose profile done at the vets covering the whole day so adjustments can be made if necessary. I have got to say that, faced with the daunting prospect of giving an injection, I couldn’t have asked for a more placid, good-natured cat – she’s so sensible and calm, she seems to be helping me. My husband is an insulin dependent diabetic too, so we now have various phials of insulin, syringes and pens in the fridge and I understand that we can test Jazz with my husband’s monitor - just as long as he can explain any anomalies when he goes for his hospital checks!! All rights reserved. I am not a medical practitioner of any sort. Implement suggestions on this website at your own risk. Whilst I believe everything on this site to be accurate, you must not follow any advice on this site without consulting your vet.